While I was planning my Bali trip, I troubled many people for inputs- Mahesh Semwal, Suryanarayana Kedlaya, Dhananjaya Moorthy, Nisha Jha, Lakshmi Sharath and many others. They all happily helped with various inputs and suggestions. I had inputs on where to stay, what to see and so on. I am thankful to them for their inputs but it was still a big task to put these inputs together and draft a day-wise itinerary for my Bali visit. Now that I have first hand experience exploring Bali, I am presenting to you an optimized plan which you can use as a base to plan your visit to Bali, Indonesia. This plan focuses more on exploring places of interest around Bali. If you prefer other things- like relaxation, food, water-sports etc, please tweak it accordingly. There is more to Bali than the beaches and temples in the south. Majority of the tourists seem to misjudge Bali, arrive with poor plans and return without experiencing best of what Bali has to offer. Thanks to this post, you don't have to do the same mistake and make the most of your visit by exploring lesser known spots in Bali. It is recommended to spend half of your time in North Bali, around Ubud area- as Ubud will be an ideal location to explore most attractions in Northern Bali. I made a mistake and stayed in Kuta-had to travel 30 kms one way, 60 kms /2 hours each day traveling north from Kuta. 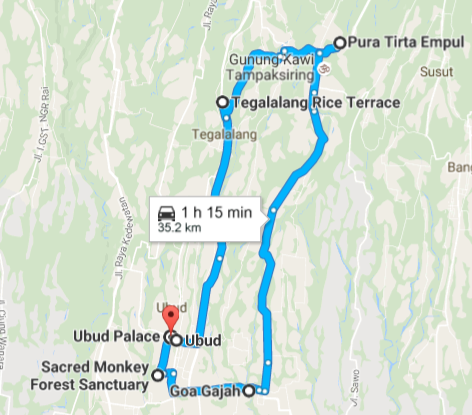 You can avoid this by staying in Ubud area- save on time, taxi fare. Rest of your stay, spend somewhere down south- Nusa Dua or adjacent areas. 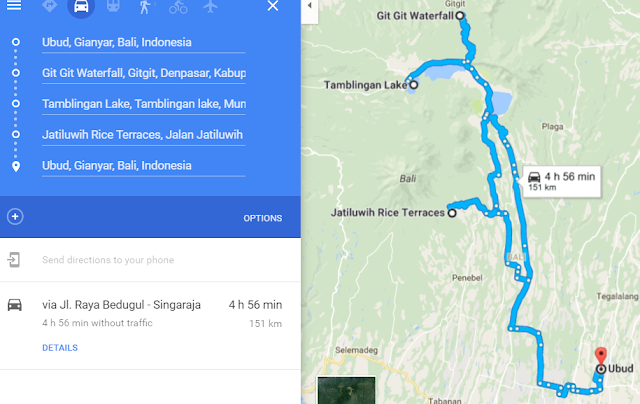 There doesn't seem to be any proper public transportation in Bali- you will have to plan your movements using one of these options. Walking is not really an option as Bali is a vast area. Packages that include transportation- Most operators sell tour packages that involve hotel pickup and drop. While it is very convenient, it consumes lots of time as dozens of guests need to be picked up from different hotels. Also not very flexible as operators work on a well defined, standard plan. Bike Taxi and traditional taxies: Will be expensive if you rent them for whole day/100s of kms- your last option if nothing else works out. Assuming you have planned your stay and travel as per above, below is the itinerary I would recommend. On your way back, take a deviation towards Tamblingan Lake to enjoy pristine views and for some local food with a view. Experience Jatiluwih Rice Terrace and its long trail- you can walk/ride in between this beautiful rice terrace or just sip a coffee at a cafe overlooking the rice terrace. You can either avail one of the organized tour for Mount Batur sunrise trek (Prior booking is needed, pick-up from Ubud at about 3.30-4 AM usually, cost around 65 USD per person) or plan to explore Mount Batur and nearby areas on your own. Below plan assumes the later. Leave early and reach Mount Batur. Hire a guide and trek to top or enjoy bath in one of the hot springs. Now you will be very close to Virgin Beach and Blue Lagoon beach which can be explored on your way back to Ubud. Pura Tirta Empul - A popular temple, take a dip here. 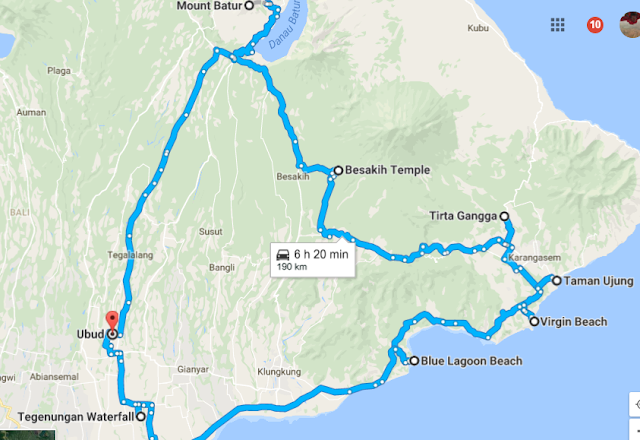 Time to explore Southern most part of Bali.. [Map link here] My detailed post comparing various beaches in Bali could be of further help. Begin with the Pandwa Beach, which has statues of Bhima, Arjuna, Nakula, Sahadeva etc carved in the rock. Return flight tomorrow- Sad thing no? Spend this day exploring Kuta and Sanoor areas and the popular Tanha Lot. 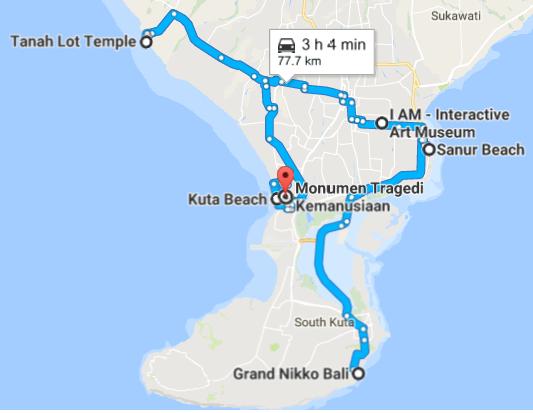 You may either shift to your 3rd Hotel say in Kuta area (will be very close to Airport) or continue the stay at Nusa Dua. Depending on your interest, try shopping in Kuta area, or a massage or try some adventure sports such as surfing or other water sports, try a Safari in VW open top jeeps simply relax by the pool at your hotel. A visit to the national monument and I AM BALI Interactive Art Museum will be a good experience. A visit to Tanha Lot during sunset time is highly recommended. If your flight is in the evening, you will have half a day to explore anything pending in your wishlist. If it is in the morning, then head to airport. Bali has numerous beaches and temples- only a small portion is covered in this itinerary. But most of the important attractions are covered.. Do your research and customize as deemed necessary. Hope this itinerary was useful to you. Enjoy your trip. One of the most useful blogs on Bali ! Great effort ! We will be staying 3 nights in tanah lot area and 4 nights in Seminyak... What can we do? Hey.. It's a great detailed itinerary,very useful. I just had one doubt if you can help it'll be great. Did you got International Driving Permit from India or got tourist driving license in Bali.? Do tourists get checked for these licenses in Bali? As per my knowledge IDP helps but not mandatory. I haven't seen police checking license, but yes, they are authorized to, so no guarantee that they will never check. So if checked you should be good with your papers.